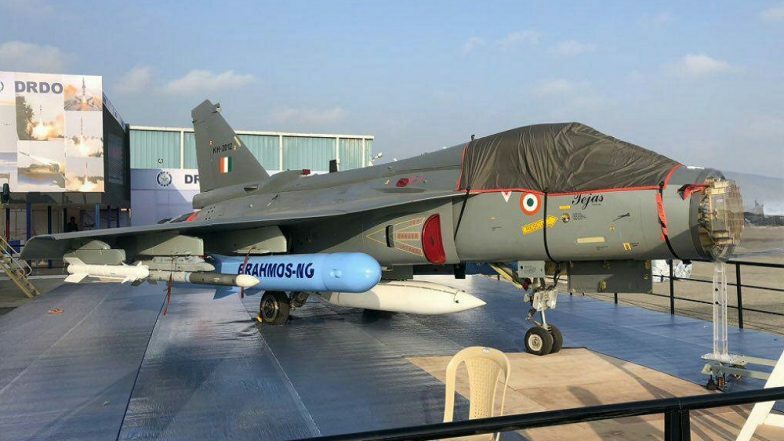 Bengaluru, February 23: During the ongoing Aero India show at the Yelahanka Air Force base in Bengaluru, the two dummy of the lighter faster and more lethal version of the BrahMos supersonic cruise missile named Brahmos NG (next generation) fitted with Light Combat Aircraft Tejas were showcased. The missile is being developed specifically for the Indian Air Force (IAF) fighters. The upgraded version of BrahMos is expected to be tested in three years. BrahMos Supersonic Cruise Missile Test Fired From Odisha’s Chandipur. BrahMos NG will be capable of hitting targets at a distance of 300 km. The new version of the missile will weigh 1.5 tonnes and will fly at a speed of 3.5 Mach (almost 4,300 kilometres per hour) instead of the current 2.8 Mach. According to reports, the BrahMos IAF’s Sukhoi-30 MKI is capable of carrying five such missiles while an upgraded version of indigenous-built Tejas aircraft, LCA Tejas Mk 2 will be configured to carry two BrahMos missiles. BrahMos-The Supersonic Cruise Missile Successfully Test-Fired From Pokhran in Rajasthan.